Sweden has the world’s first biogas powered train running of the 75 mile long coastal stretch between the cities of Linkoeping (south of Stockholm) and Vaestervik (Eastern Baltic). “Amanda” as the train has been named has been carrying passengers since the summer of 2005. Biogas is produced when organic materials decompose in the absence of oxygen – for example in landfill sites or anaerobic digesters. Fitted with two biogas bus engines, Amanda can carry up to 54 passengers at speeds of up to 80mph and has a range of almost 400 miles before refuelling. 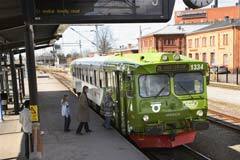 The biogas used by the train is produced locally at the Vaestervik sewage treatment plant. In Linkoeping another plant uses waste products from a local abattoir to produce further biogas. The fat, blood, unwanted organs, and guts of about 30 cows stewed for one month are all that is needed to produce sufficient biogas to power the train to the other end of the line. A standard 24m long diesel powered train was converted by replacing the diesel engines with two 210kW Volvo GH 10 B biogas bus engines and adding gas storage cyclinders to hold the biogas fuel. 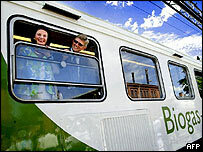 Development of the biogas train cost Svensk Biogas over 1 million Euro. Diesel powered trains are currently 20% cheaper to run than biogas trains however as oil prices increase the environmental benefits of the biogas train will be joined by economical benefits. Currently 25% of all energy use in Sweden is derived from biomass and the country intend to become carbon free by 2050. All the buses in Linkoeping are already powered by biogas.